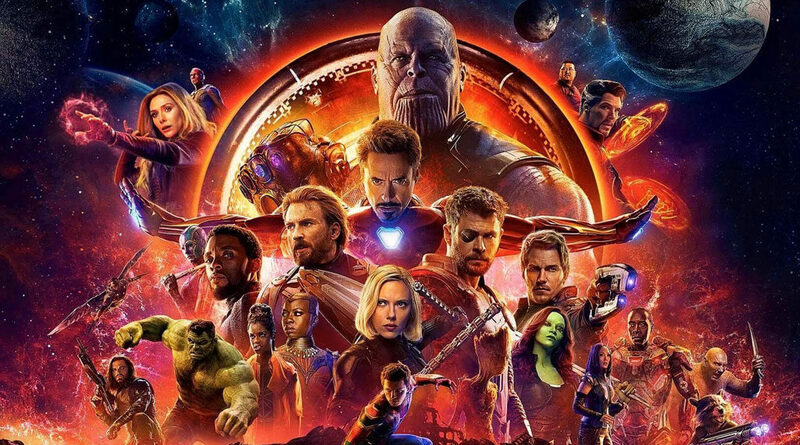 The superhero or comic book film genre, as represented by Avengers: Infinity War, is for current audiences what musicals and westerns were for the moviegoers of yore (finally got to use that word). 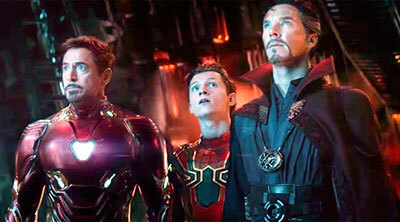 Thanks in large part to Marvel Studios, superhero flicks have set the standard for our movie theater experience to the point where not having an in-credits or post credits scene is a daring, subversive poker move. (Hey, Logan!) Critics have warned of possible superhero over-saturation and the need to “shuffle the deck” as it were. Thankfully, Wonder Woman, Thor: Ragnarok and Black Panther each managed to shake things up a bit recently. Still, Avengers: Infinity War was going to be special for many reasons. Expectations for it are astronomical. Its budget makes it a huge gamble, even for Disney. This latest entry in Marvel’s flagship melee team-up franchise is the most ambitious attempt at to date at topping the very formula that producer Kevin Feige and his Marvel Studios have refined for the last decade. But it is worth your time or should Marvel cash in its chips? Read on, true believers! The movie’s roster reads like a Christmas toy list. Tony “Iron Man” Stark (Robert Downey Jr.). Steve “Captain America no more” Rogers (Chris Evans). Thor “like father, like” Odinson (Chris Hemsworth). Bruce “shy Hulk” Banner (Mark Ruffalo). Natasha “blonde Black Widow” Romanoff (Scarlett Johansson). Peter “Spider-Man” Parker (Tom Holland). “Doctor” Stephen Strange (Benedict Cumberbatch). Vision “the being formerly known as J.A.R.V.I.S.” (Paul Bettany). Wanda “Not-a-Witch” Maximoff (Elizabeth Olsen). Peter “Starlord” Quill (Chris Pratt). Drax the “oblivious” Destroyer (Dave Bautista). The daddy-issues twins, Gamora (Zoë Saldaña) and Nebula (Karen Gillan). Rocket Raccoon (Bradley Cooper/Sean Gunn). Mantis (Pom Klementieff). Teenage “I am” Groot (Vin Diesel). King T’Challa, the Black Panther (Chadwick Boseman). The heroes also brought their plus-ones and tag-alongs. James “War Machine” Rhodes (Don Cheadle). Bucky “it’s all good” Barnes (Sebastian Stan). Sam “Falcon” Wilson (Anthony Mackie). Loki, god of double-agents (Tom Hiddleston). Heimdall, god of good eyesight (Idris Elba). Wong “but feels so right” (Benedict Wong). Okoye “is Wakandan for badass” (Danai Gurira). M’Baku (Winston Duke). Shuri “the sister we all want” (Letitia Wright). The list goes on and on. 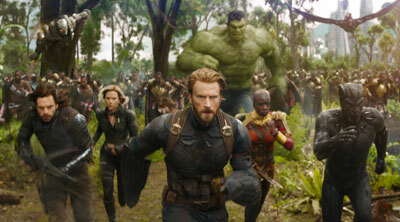 Avengers: Infinity War doesn’t waste a second of its two-and-a-half-hours. It immediately sets up the darkness to come, while balancing it perfectly with Marvel’s patented brand of levity. The film manages to juggle its massive cast and give each character his or her moment to shine. 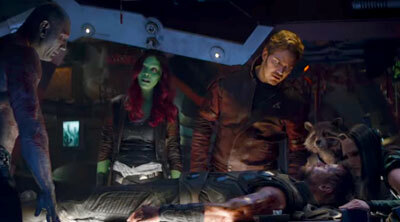 Downey and the Chris triplets (Evans, Hemsworth and Pratt) arguably feature the most among the heroes since they serve as connective tissue between all encounters with Thanos. Even so, it’s many of the “lesser” players that get the biggest emotional beats. Some of Thanos’ minions also stand out, chief among them the silver-tongued zealot Ebony Maw (Tom Vaughan-Lawlor). As a result, each of the great-looking CG set pieces pack extra weight. We care about the motivations of each of the weirdos fighting for their lives on screen. The spectacle elates because it wears its beating heart on its sleeve. 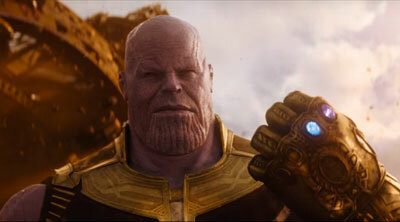 Regardless, Avengers: Infinity War would probably not amount to much were in not for Brolin’s turn as the big bad Thanos. His may be the most realized CG character since Andy Serkis’ Caesar in the recent Planet of the Apes trilogy or Bill Nighy’s Davy Jones in the Pirates of the Caribbean franchise. For years, Brolin has proven dependable in any type of role. Advanced mo-cap technology allows his nuanced acting choices to shine through the polygons. His delivery is never less than riveting. Thanos is clearly a sociopath with a strong will and a huge ego, but you can almost empathize with his radical ideology. He wants to make the universe a better place by any means necessary, after all, and he will get his hands dirty to do so. If that makes him the bad guy, so be it. Final Chapter or Season Finale? Except, in this case, you know some things must eventually return to normal. The powers-that-be at the studio will not give up on their cash cows so easily. They know we’ll come back to see what happens next. Furthermore, it’s unlikely that we’ll fall for the same magic trick twice. Still, kudos to Feige, directors Anthony and Joe Russo, as well as screenwriters Christopher Markus and Stephen McFeely, for daring to play as much with expectations. They are skilled poker players holding a full house of tarot cards drawn by Jack Kirby, yet they still bluffed their way towards winning all the chips in just one round. The guys at Marvel knew Avengers: Infinity War would be a worldwide hit regardless. After all, they’ve perfected their formula to translate their massive IP successfully to the big screen. That they chose a slightly different path for the film, and went the extra mile, is proof that current comic book cinema has matured as a film genre. We’re anxious to see what they’ll have up their sleeve next time. Movie description: A massive cinematic card trick that pays off ten years of Marvel Studios fandom while leaving audiences desperate for more.